10-9-8-7-6-5-4-3-2-1…Happy New Year! 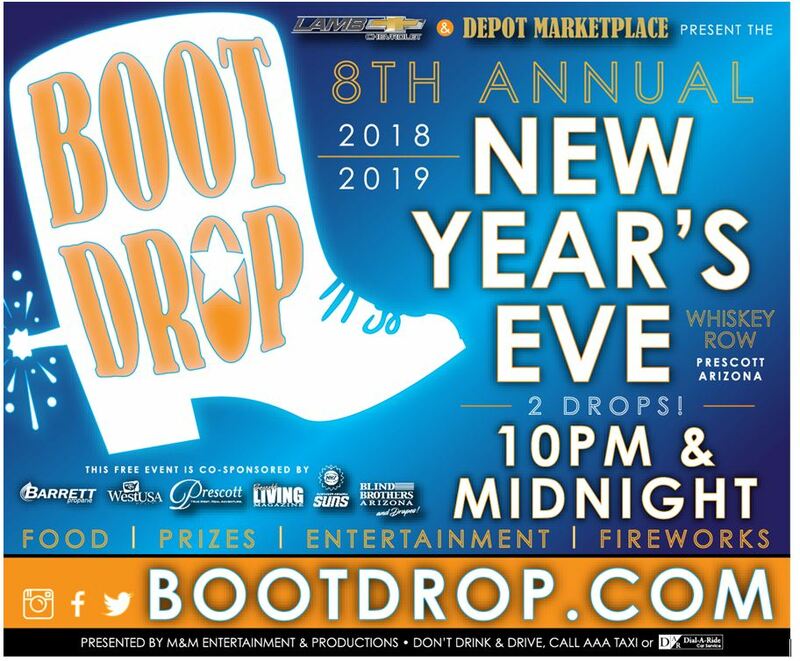 Those folks fortunate enough to be on Whiskey Row at the stroke of 10PM or midnight will be joined in Northern Arizona’s best party with the spectacle of the New Year’s Eve Boot Drop. Thousands will welcome 2019 on Monday, December 31st, 2018 from 8pm to 12:30am. This will be the 8th Annual event and is free to all ages. The festive 6-foot illuminated cowboy boot lowers down from a 40-foot flagpole with 2 drops; the first at 10pm and the second drop at midnight. As the crowd cheers in the New Year, fireworks will light up the night sky. The earlier drop occurs simultaneously with the traditional “Ball Drop” in New York City. It is especially popular with young families and those who wish to retire early after celebrating the New Year. Many stay to cheer both drops because twice is nice. The boot descends from atop the historic Palace Building which is over 30 feet high. One can only wonder how past residents like Wyatt Earp and Doc Holliday would have appreciated the goings on. The last seven years have drawn thousands of people of all ages. 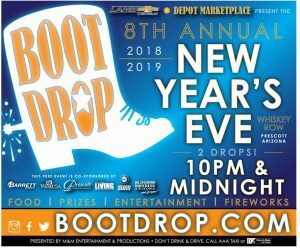 While not as big as the ball descending in Times Square since 1907, the Whiskey Row Boot Drop event is woven into Prescott’s holiday spirit and is a fitting closing celebration in Arizona’s Christmas City. Prizes are given throughout the night with DJ music by Magic 99.1 FM, rides on a Ferris wheel, food and drink from vendors.